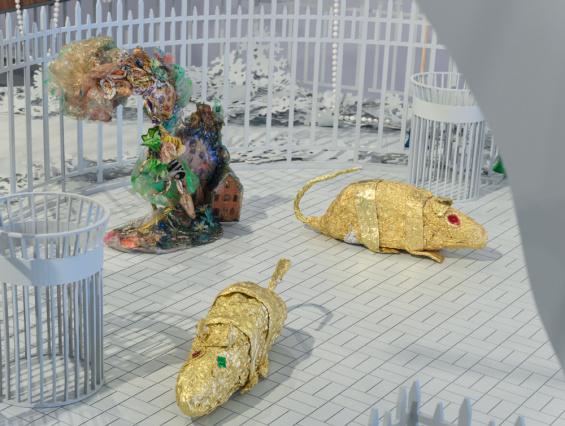 Join us for a Family Day drawing inspiration from the exhibition “MOTHA and Chris E. Vargas: Consciousness Razing,” on view at the New Museum from September 26 to February 3, 2019. Families may visit the fifth floor to explore a scale model of Christopher Park, which President Obama designated as a national monument to commemorate the Stonewall Riots. In the Sky Room, families are invited to collectively design a park, adding monuments, plants, or other elements they would like to see in the imagined landscape. This First Saturday is on December 1, World AIDS day and the annual Day With(out) Art—a national day of action in response to the AIDS crisis. Visitors may wish to attend “Stonewall is Not Here Yet,” an afternoon of readings organized by artist Sharon Hayes and Chris E. Vargas or Visual AID’s premiere of ALTERNATE ENDINGS, ACTIVIST RISINGS, screening in the theater. Support for “MOTHA and Chris E. Vargas: Consciousness Razing” can be viewed here.